MEXICO CITY. The storm Carlotta weakened on Sunday to become a tropical depression while generating torrential downpours on the Mexican coast of the Pacific in the Zihuatanejo region. 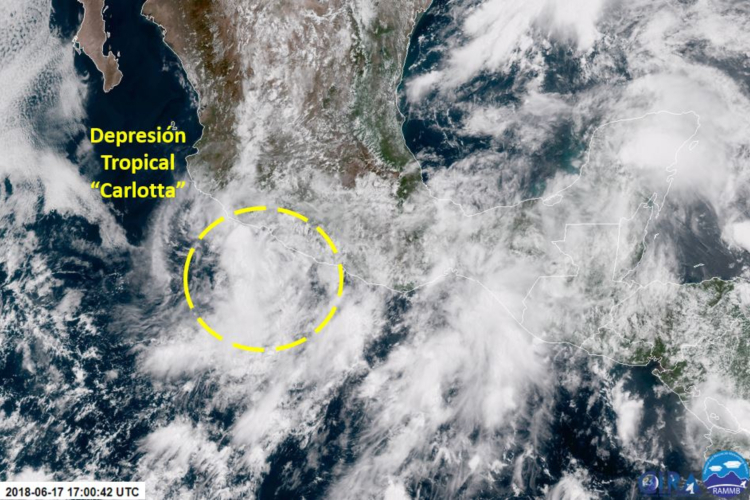 Carlotta, the third storm baptized this season in that ocean, had maximum sustained winds of 55 kilometres per hour in the afternoon, according to the National Hurricane Center of the United States, and its center was located about 55 kilometres south of that tourist port. The center of the storm is likely to make landfall on Monday, the agency added. It is generating heavy rains and the possibility of flooding on the coasts of the southern states of Guerrero and Michoacán, and precipitation in some areas could reach 250 millimetres. Acapulco Elements of the Eighth Naval Region activated the Marine Plan in its prevention phase in the municipality of Acapulco, to help the population, after the damage left by the tropical storm ‘Carlotta’. Through a statement, it was reported that the population affected by the meteorological phenomenon was scaled to the Auxiliary Phase today. Elements of the Navy, assigned to the Eighth Naval Region is prepared with thousand 945 elements between Admirals, Captains, Officers, Classes and Seamanship, as well as vehicles, surface units such as ships and aircraft, to carry out evacuation tasks and safeguard to the habitants.